The Bermuda Gymnastics Team returned to Bermuda last evening [July 10] at the LF Wade International Airport from the 2011 Island Games to a hero’s Welcome. 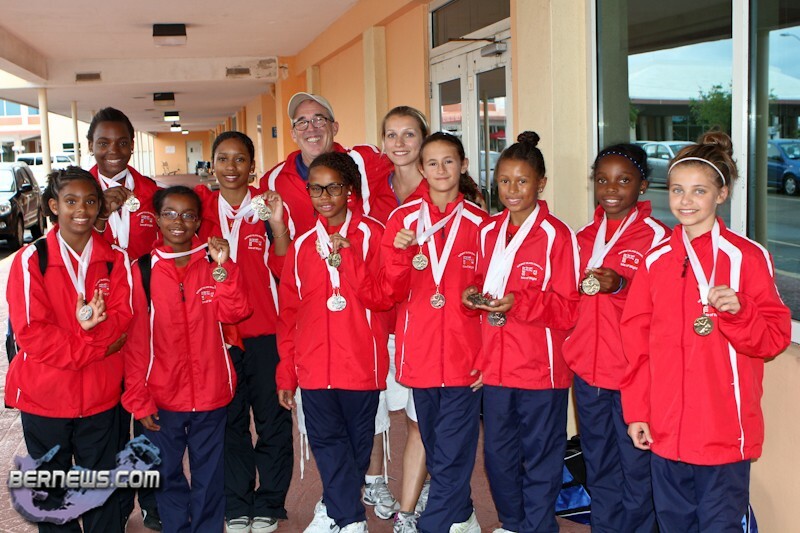 The team won an overall 24 medals which brought Bermuda’s overall total of medals won at the Games to 42. Overall Kaisey Griffith won 2 gold medals and a bronze, Morgan Beckles won 3 gold medals and a bronze, Tabytha Hofheins won a gold medal and a bronze while Sydney Mason won a bronze and Zantae Dill won a bronze medal. Clare James won a bronze medal, Samatha Soares won a bronze medal, Sadia Wilson won 4 gold medals, a silver medal and a bronze and Tais Burgess-Allen won a gold, silver and bronze medal. The Senior Team won a silver medal while the Junior Team won the gold medal. Very proud! well done ladies! Well done ladies you all did a GREAT job. A special well done to my beautiful niece Tomei I am so very proud keep up the great work beautiful.If anyone gets the chance to see these ladies in action you will be BLOWN away.